Watercolor on paper. 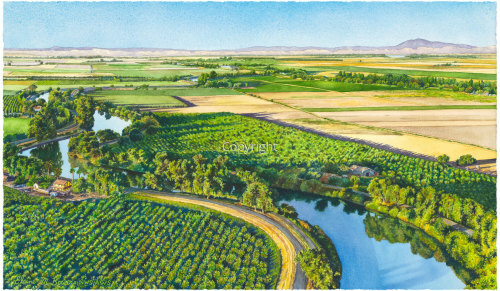 This painting is an aerial view of the Sacramento River and delta. It is on exhibit at the Bolivarian Museum of Contemporary Art in Santa Marta, Columbia at the invitational International Triennial Watercolor Show this summer. Mt Diablo is in the background and the buildings are on Grand Island near Walnut Grove, California. The small white house in the background is Grand Isle Mansion. There is a golden light because this image is at dawn, thus the deep long shadows. Note: Sale is pending upon return from Colombia, giclée prints are available. Watercolor on paper. Aerial view of the Sacramento delta area near Grand Isle Mansion, North of Walnut Grove, CA. Mt. Diablo is in the background. I am honored to have this painting awarded the "Outstanding Landscape" in the American Women Artists Spring Online Show 2018. Watercolor on paper. Aerial view of the Sacramento Delta near Walnut Grove, California with Mt. Diablo in the background. This painting was in the AWS 149th International Show in NYC and toured the US for a year with stops in 8-10 cities. It is the painting that earned the artist "signature status" in the American Watercolor Society. Aerial view of the Sacramento Delta. Aerial view of Sacramento River. Is the grass greener on the other side? My inspiration comes from this aerial view of a flock of sheep meandering through greener pastures in Rio Vista, CA near the Sacramento Delta. One ewe looks back at the viewer as though in curiosity, thought or contemplation. Could the grass be greener where the viewer stands? What is the viewer doing that interests the ewe? Is the viewer woolgathering or is it the ewe doing so... perhaps both. Woolgathering is an early 16th century reference to those who collected tufts of wool from bushes and fences. The woolgatherers would wander aimlessly collecting the bits of wool. The term ‘woolgather’ came to mean aimless thought or daydreaming. The title reflects this double meaning. The artist allows the viewer to decide who is woolgathering, the ewe or the viewer.